2 Introduction Quiz (Standard Deviants Module 1 and 2) 1. Shakespeare was born in 1616 in the town of Stratford-upon- Avon. 2. Shakespeare lived and wrote during the Renaissance, the Elizabethan Era. 3. The theatrical company that Shakespeare belonged to was called Lord Chamberlains Men, and then renamed The Kings Men. 4. Shakespeare wrote tragedies, comedies, and histories. 5. Shakespeare is not famous for his poems. 6. Shakespeare wrote in blank verse and iambic pentameter. 7. The Globe theater was square in shape, open air with enclosed galleries. 8. Shakespeares audience did not have to listen intently to the words or language. 3 Introduction Quiz (cont.) 9. Shakespeare uses symbolism in his plays; they represent the universals like good, evil, purity, truth, beauty, and justice. 10. Shakespeares theater used a lot of scenery, costumes, and props. 11. A tragedy is a play where the hero suffers but recognizes his mistakes; a terrible beauty. 12. A tragic figure will suffer a reversal of fortune. 13. Oedipus Rex is not a good example of a tragedy. 14. Tragedies of the Middle Ages were stories meant to teach morals to the audience. 15. Romeo & Juliet was Shakespeares last tragedy written, the last of ten. 4 Act I: Quick Quiz Directions: Read each statement. Decide if it is true or false. 1. The play is set in Verona, Italy. 2. The fight between the servants begins because of an ill-word. 3. The Prince threatens the families with the punishment of exile if found fighting again. 4. The families have disturbed the peace 3 times thus far. 5. Romeo is Montague. 6. Benvolio plans to cure Romeos lovesickness for Rosaline by finding another one for him to love. 7. The most eligible bachelor in Verona, Romeo, has asked Lord Capulet for his daughters hand in marriage. 8. Juliet is 14 years old when the play opens. 9. Mercutio wishes to attack Romeo during the Capulet ball; Lord Capulet stops him. 10. It is the nurse who finds out the identity of Romeo and tells Juliet the bad news. 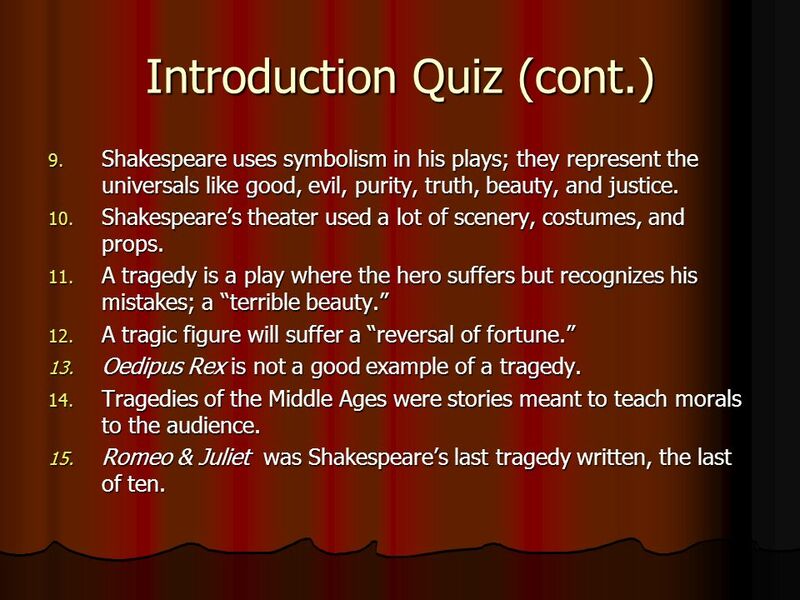 5 Act II: Quick Quiz Directions: Match each character with their description. RomeoMercutioNursePeter JulietBenvolioBalthasarFriar Laurence 1. He warns the lovers to love moderately; they stumble that move fast. 2. He is Romeos servant and responsible for bringing the rope ladder to Juliets nurse. 3. She is the only daughter of Capulet who wishes to marry Romeo. 4. He is the nurses servant and accompanies her to see Romeo. 5. He is Romeos cousin; glad to see Romeo is back to his old self. 6. She takes 4 hours to deliver news of the wedding. This frustrates Juliet. 7. He is Romeos good friend and worries about the challenge Tybalt has sent to Romeos home. 8. He has buried an old love (Rosaline), and dug up another (Juliet). 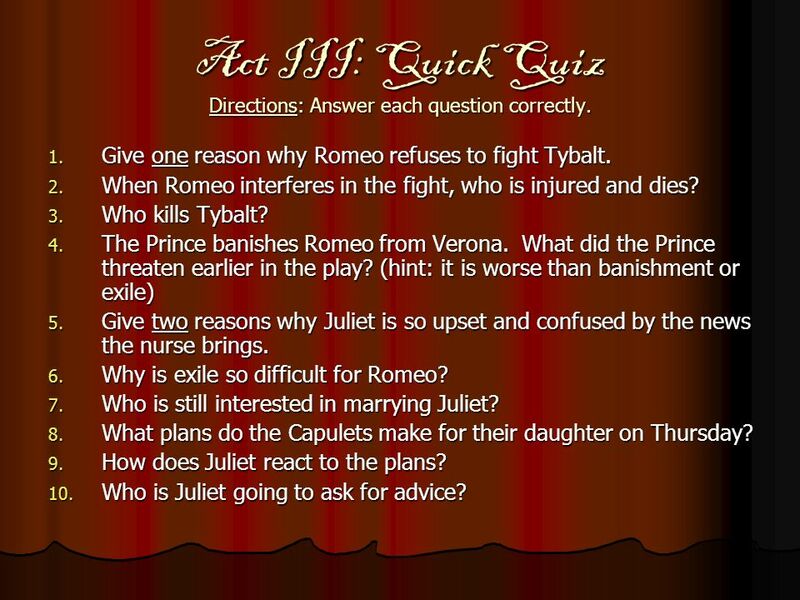 6 Act III: Quick Quiz Directions: Answer each question correctly. 1. Give one reason why Romeo refuses to fight Tybalt. 2. When Romeo interferes in the fight, who is injured and dies? 3. Who kills Tybalt? 4. The Prince banishes Romeo from Verona. What did the Prince threaten earlier in the play? (hint: it is worse than banishment or exile) 5. Give two reasons why Juliet is so upset and confused by the news the nurse brings. 6. Why is exile so difficult for Romeo? 7. Who is still interested in marrying Juliet? 8. What plans do the Capulets make for their daughter on Thursday? 9. How does Juliet react to the plans? 10. Who is Juliet going to ask for advice? 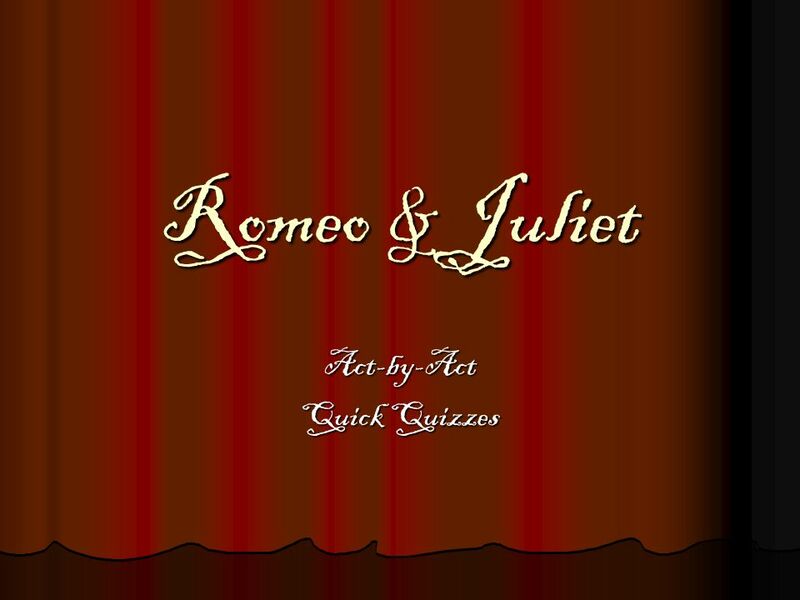 7 Act IV: Quick Quiz Directions: ParisRomeoJulietLord Capulet Friar LaurenceNurseTybaltPeter 1. Juliet worries she will awake in the tomb and see the dead corpse of this man. 2. He compares his daughter to a flower who has been bitten by frost. 3. He is responsible for giving Juliet the potion and coming up with the plan. 4. He is exiled/banished to Mantua and awaits news of his love. 5. He is visiting the Friar and setting up plans for the wedding on Thursday. 6. She finds Juliet dead. 7. He threatens the musicians. He wants them to play sad music. 8. She takes a dagger to bed with her in case the potion doesnt work. 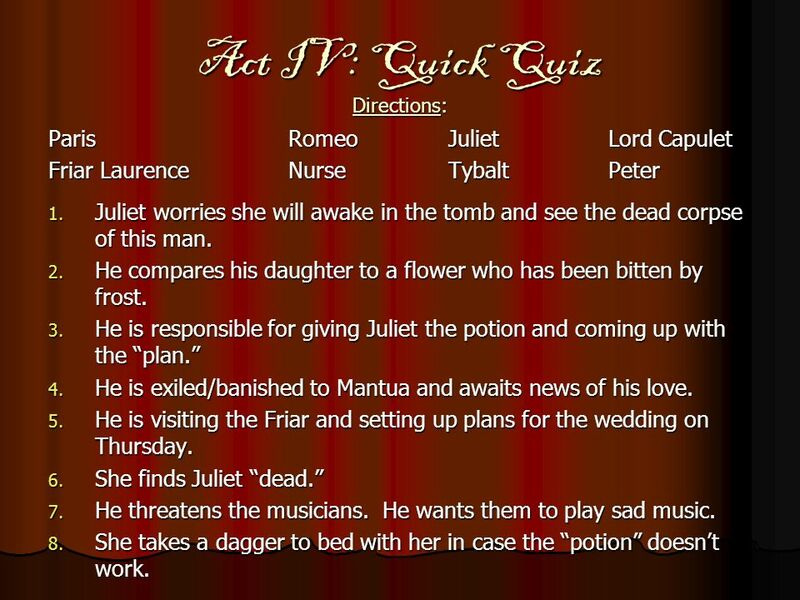 Download ppt "Romeo & Juliet Act-by-Act Quick Quizzes. 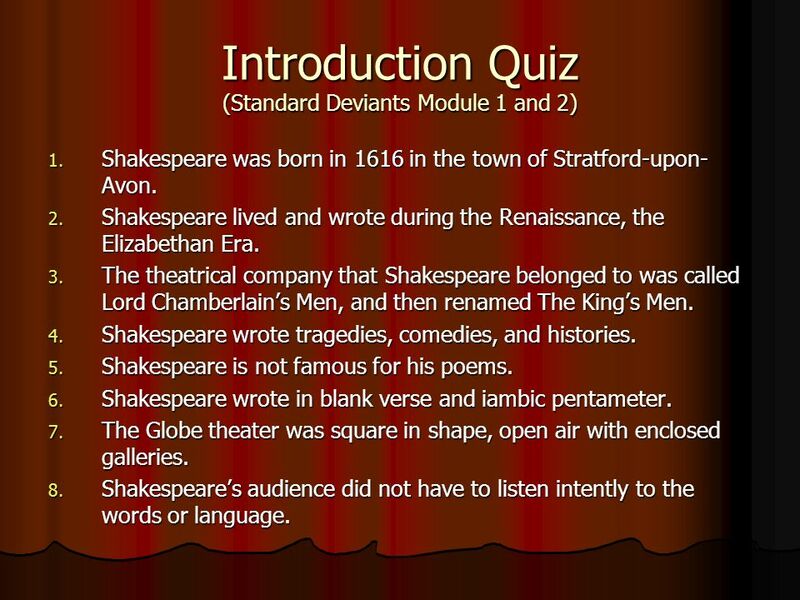 Introduction Quiz (Standard Deviants Module 1 and 2) 1. Shakespeare was born in 1616 in the town of Stratford-upon-"
ACT III `Study Guide Work silently on your study guide. Read Act III to yourself and answer the questions. 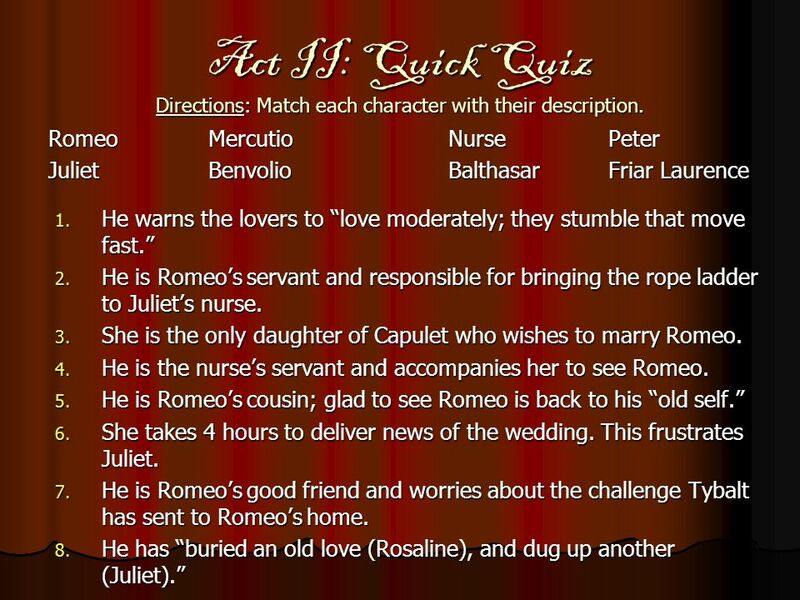 MULTIPLE CHOICE Romeo and Juliet. Romeo and Juliet  Exam Review. Name That Character. 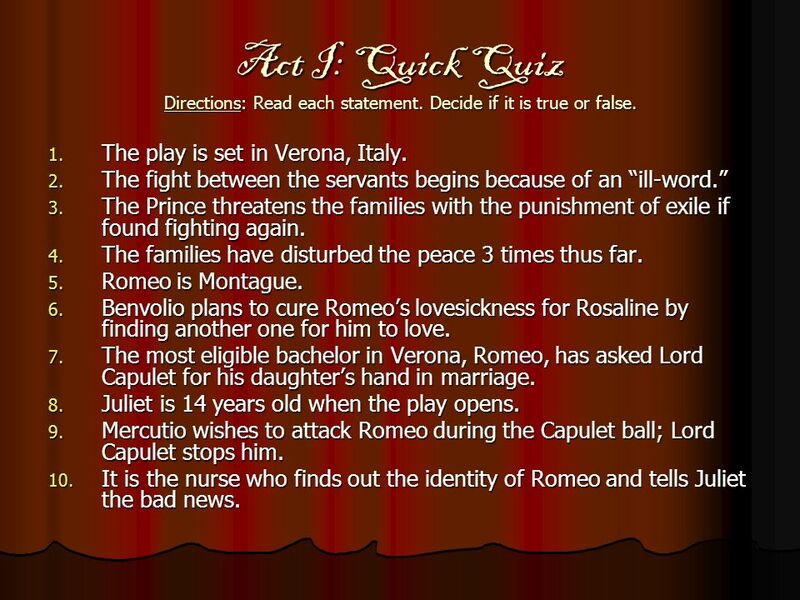 Romeo and Juliet Act V Study Game Write down any questions and answers you do not know and study those for your retake. Romeo & Juliet Summaries. Act I, Prologue In a sonnet, the chorus tells the audience that the play will concern a pair of lovers whose deaths will end. Romeo and Juliet A Star-crossed Romance. A Brief Introduction Romeo and Juliet was written by Shakespeare in 1594 or Romeo and Juliet was an experimental. Romeo and Juliet Acts II – IV Study Game. Friar Lawrence’s cell Instead of returning home, where does Romeo go after the ball at which he meets Juliet? Shakespeare’s Life What’s the Source? Who’s Who? That’s. R&J Study TEST STUDY GUIDE ACT I 1. The setting of Romeo and Juliet is _________________. a. Stratford-on-Avon, England b. Venice, Italy c. Verona, Italy. THE TRAGEDY OF ROMEO AND JULIET William Shakespeare. Characters in Romeo & Juliet. In Verona, Italy in the late 1500's, two powerful families, the Montagues and the Capulets, have been fighting with each.